The New York State Library has an extensive collection of education and education-related information, current and historical. This collection includes Educational Resources Information Center (ERIC) indexes, ERIC documents, New York State, Federal and other state documents, college catalogs, books and journals. As a depository for New York State documents, the State Library has a comprehensive collection of these publications. Assembly and Senate documents, the Legislative Document series, Judicial Decisions of the Commissioner of Education and documents of the Board of Regents are just a few of the many resources available in the State Library which deal with education law. ERIC indexes are comprised of two separate print indexes; Current Index to Journals in Education (CIJE)1966+) and Resources in Education (RIE). These two indexes are combined in the online ERIC database. Education Index (1929+). This index provides citations to articles from English language periodicals and yearbooks. Education-related books in English, 1995 or later, are also indexed. It is published by the H.W. Wilson Company. College Catalogs. Some bound college catalogs are listed in the online catalog. A reference collection of mostly New York State college catalogs, dating from the 1800s to the mid-1970s, is not listed in the online catalog. These older college catalogs may require several business days to retrieve. Arrangements should be made prior to visiting the Library. Use the Ask a Librarian page to make your request. We have Regents Examinations going from the first exam in the 1800s to the present. Titles, dates of coverage, and call numbers are listed below in date order. The location for all of these examinations is D-NYS-DOC and they are part of our New York State documents collection. Many Regents Exams are available online. Unless they appear in our online catalog, the New York State Library does not hold copies of proficiency examinations. In addition to the current core curricula and curriculum resource guides which are available from our online catalog and Digital Collections, these materials are available online via the New York State Education Department's EngageNY web site. The New York State Library subscribes to the two major education databases, ERIC and Education Full Text, as well as other databases which contain education content such as Academic Search Complete, JSTOR, Project Muse, and Science Direct. These databases can be searched onsite at the State Library or remotely by registered borrowers whose cards begin with a P.
ERIC is available freely over the Internet, as well as onsite at the State Library. The Educational Resources Information Center, ERIC, was established in 1966, and is supported by the US Department of Education, Office of Educational Research and Improvement, and the National Library of Education. It consists of more than two million items including documents, journal articles, research syntheses, conference papers, technical reports, policy papers, and other education-related materials and is updated biweekly. ERIC indexes education-related materials from scholarly organizations, professional associations, research centers, policy organizations, university presses, the US Department of Education and other federal agencies, and state and local agencies. Individual contributors submit conference papers, research papers, dissertations, and theses. If available, links to full text are included. From the ERIC website, special collections from the What Works Clearinghouse and the Regional Educational Laboratories can be searched individually. These targeted searches highlight programs which have been found to be successful in promoting student achievement. Education Full Text is the online version of Education Index and contains indexing from 6/83-present, abstracts since 1/94, and fulltext since 1/96. 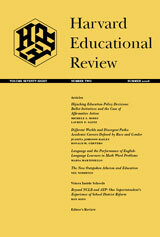 Education Full Text indexes and abstracts articles of at least one column in length from English-language periodicals and yearbooks published in the United States and elsewhere. English-language books relating to education published in 1995 or later are also indexed. CollegeSource is an online database containing approximately 43,415 full cover-to-cover, original page format college catalogs. It includes 2-year, 4-year, graduate, professional and international schools. CollegeSource can only be accessed onsite at the New York State Library. ERIC document collection. 1966+ . Document citations are identified in the ERIC database by ED followed by a number. These documents may be research reports, teaching guides, curriculum guides, lesson plans, conference presentations and other educational literature. They are not listed in our online catalog, unless a copy was obtained from a source other than ERIC. Most documents abstracted in ERIC are in the ERIC microfiche collection. Those that are not will state NOT AVAILABLE FROM EDRS in the Availability field. Check our online catalog as these are often books the State Library has in our collection. College Catalog Microfiche Collection 1975-1999/2000. US and international colleges and universities are included. The New York State Library subscribes to major education journals such as Educational Leadership, Phi Delta Kappan, and the American School Board Journal. In addition, the State Library also carries journals in many related fields, such as psychology, history and the arts. Print and microfilm subscriptions are supplemented by the many online journal holdings the State Library has. To find out what holdings the Library has electronically, go to the online journal list. You can search for online journals by title or browse by subject. Records for online journals are also in the New York State Library's online catalog. The Education Internet bibliography has selected Web sites for Education (K-12). There is also an Internet bibliography with Web sites for Colleges and Universities. These web sites reflect the State Library's holdings and are intended to provide resources for those who cannot use the Library's resources onsite. The New York State Library's FAQ (frequently asked questions) page provides resources for persons looking for educational information, including how to locate a copy of their high school diploma.